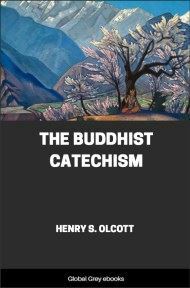 The Buddhist Catechism was Olcott's attempt to elucidate the basic doctrines of Buddhism in an ecumenical way. This book is still in use today in Sri Lanka. Olcott is fondly remembered in Sri Lanka and by Theosophists world-wide. 1. Question. Of what religion are you? 2. Q. What is Buddhism? A. It is a body of teachings given out by the great personage known as the Buddha. 3. Q. Is "Buddhism" the best name for this teaching? A. No; that is only a western term: the best name for it is Buddha Dharma. 4. Q. Would you call a person a Buddhist who had merely been born of Buddha parents? A. Certainly not. A Buddhist is one who not only professes belief in the Buddha as the noblest of Teachers, in the Doctrine preached by Him, and in the Brotherhood of Arhats, but practises His precepts in daily life. 5. Q. What is a male lay Buddhist called? 6. Q. What a female? 7. Q. When was this doctrine first preached? A. There is some disagreement as to the actual date, but according to the Sinhalese Scriptures it was in the year 2513 of the (present) Kali-Yuga. 8. Q. Give the important dates in the last birth of the Founder? A. He was born under the constellation Visā on a Tuesday in May, in the year 2478 (K.Y. ); he retired to the jungle in the year 2506; became Buddha in 2513; and, passing out of the round of rebirths, entered Paranirvāna in the year 2558, aged eighty years. Each of these events happened on a day of full moon, so all are conjointly celebrated in the great festival of the full-moon of the month Wesak (Vaisākha), corresponding to the month of May. 9. Q. Was the Buddha God? A. No. Buddha Dharma teaches no "divine" incarnation. 10. Q. Was he a man? A. Yes; but the wisest, noblest and most holy being, who had developed himself in the course of countless births far beyond all other beings, the previous BUDDHAS alone excepted. 11. Q. Were there other Buddhas before him? A. Yes; as will be explained later on. 12. Q. Was Buddha his name? A. No. It is the name of a condition or state of mind, of the mind after it has reached the culmination of development. 13. Q. What is its meaning? A. Enlightened; or, he who has the all-perfect wisdom. The Pālī phrase is Sabbannu, the One of Boundless Knowledge. In Sanskrit it is Sarvajña. 14. Q. What was the Buddha's real name then? 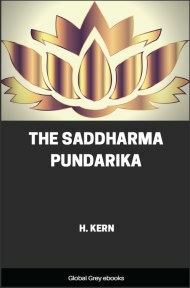 A. SIDDHĀRTHA was his royal name, and GAUTAMA, or GOTAMA, his family name. He was Prince of Kapilavāstu and belonged to the illustrious family of the Okkāka, of the Solar race. 15. Q. Who were his father and mother? A. King Suddhodana and Queen Māyā, called Mahā Māyā. 16. Q. What people did this King reign over? A. The Sākyas; an Aryan tribe of Kshattriyas. 17. Q. Where was Kapilavāstu? A. In India, one hundred miles north-east of the City of Benares, and about forty miles from the Himalaya mountains. It is situated in the Nepāl Terai. The city is now in ruins. 18. Q. On what river? A. The Rohīnī, now called the Kohana. 19. Q. Tell me again when Prince Siddhārtha was born? A. Six hundred and twenty-three years before the Christian era.